Sliced potatoes/mushroom were thinly sliced and pan fried before adding to the egg mixture. Heat 2 tbsp olive in Happy Call Pan (HCP). Add in sliced potato and pan fried on medium low heat for about 8 mins till lightly brown at the edge. Gently flip the potato slices in between, do not break them up too much. Remove the potato from pan and set aside. Using the same pan, add in sliced shiitake mushroom and fry briefly till fragrant. Remove from pan. In a mixing bowl, break in the eggs, add in mustard, browned potato slices, ham, mushroom, spring onions and cheese. Add in some salt and black pepper to taste. Stir gently to combine everything. Add another 1 tbsp olive oil to the pan and heat up the pan. Pour in the egg mixture, with a spoon, gently spread the mixture evenly. Cover the pan and lock. Cook the omelette on medium low heat for about 8-10 mins, shift the pan left to right once in between to get even browning. Open the pan lightly and check the surface is well set but not overcook. The edge should be browned and middle with slight wobble. If not lock the pan and cook for another 1 min. With a silicon spatula, lightly run through the sides of the omelette to loosen it. Cover the lid and lock it. Swiftly turn the pan and cook the other side of the omelette. Turn on heat to medium. Sift the pan from left to right, 1 min each to brown it. By this time the omelette will be well set. Flip over the pan and open the lid, check whether the surface is well browned, if not lock the pan and flip to cook for another 1 min. 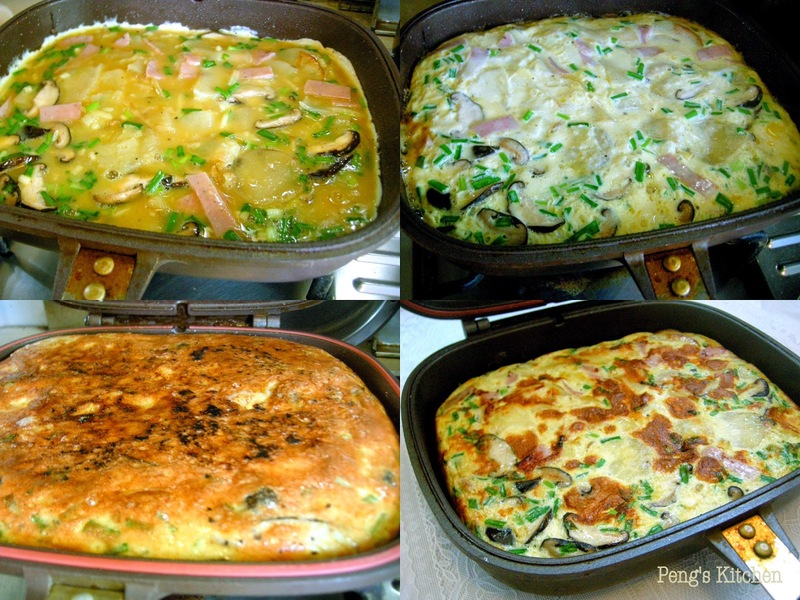 The omelette will puff up a lot during the cooking process but will deflate after cooking down. Cool down slightly and serve along with salad. Can be serve in room temperature, or zap in microwave for 30 secs to warm it up. The Spanish tortilla turned out rather thin unlike the original version which is thick. Nevertheless this potato omelette tasted very very yummy which the kids do not mind having it for breakfast and even their snack time! This is such a delicious meal. Eggs are always a favourite in my house, and this tortilla would be a "best seller" in my house too!